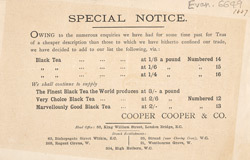 This is an advertisement for Cooper, Cooper & Co. tea. During the 19th century tea was consumed by almost everyone regardless of their age, gender or class. It was a nutritious yet non alcoholic drink that sustained men whilst they worked long hours in the dockyards and in factories but was also a sophisticated beverage enjoyed at sedate gatherings by ladies of the upper classes. Tea was so popular that many different types were stocked by grocers and wholesalers; such as Lapsang Souchong, Green Tea, Assam, and Oolong. It is the cheaper black tea that is advertised on this leaflet.